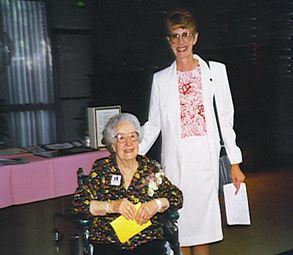 Ethel McCormack was a past FCWCC president and a member of the National Federation of Business and Professional Women’s Clubs, Fresno Chapter. In 1968, during her time on the FCWCC board, she founded an event called the bi-annual Garden Give & Take in conjunction with professors from the Plant Science Department at Fresno State. This free public event was created to bring the community together and help facilitate the exchange of all types of plants from the attendees’ home gardens – “GIVE what you have, TAKE what you need.” The event catered to both new and experienced “green thumbs.” Professors and students from Fresno State and Reedley College, along with local Master Gardeners, were on hand to answer all gardening questions. Ethel believed that by encouraging gardening, Fresno and the surrounding communities would benefit from beautification and cleaner air. The Garden Give & Take lives on today under the care of another local organization. A group of volunteers (including past FCWCC president, Margie Reisz) who previously participated in Ethel’s Garden Give & Take established a non-profit 501 (c) 3 in June 2011 called Community Volunteers Central Valley. This organization currently serves the communities of Fresno, Reedley, Biola and Madera with Plant Give & Take events and other fundraisers throughout the year. Almost 30 years after founding the Garden Give & Take, Ethel McCormack was honored with a FCWCC scholarship in her name for her years of dedication to caring, sharing, and educating the community on the beauty and importance of gardening, and to recognize her years of service to the field of business. Originally the amount of each scholarship was $100, which has been increased over the years by the FCWCC Board of Directors. Today, $500 is rewarded to each Fresno County Women’s Chamber of Commerce Ethel McCormick Memorial Scholarship recipient at Fresno City College and Fresno State.